Beginning with the first conversation about a client’s needs, we start a process of imagining creative solutions. We work with you to formulate concepts of finished furniture pieces, accounting for function, style, materials, cost and schedule. We use an extensive and reliable network of resources for the wide range of materials and technologies used in furniture making. 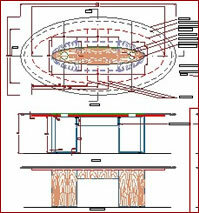 After getting “the big picture,” we may offer specific suggestions or details that might enhance the developing design. Absent a sketch, we will produce a preliminary computer drawing with enough detail to develop an accurate written proposal and price quotation. Upon acceptance of our proposal, we refine the initial drawing into a set of detailed CAD working drawings in large scale from which the furniture will be built. We are often asked if we can build a piece of furniture in “solid wood”. Of course we can, we cut our teeth building solid hardwood furniture and always look forward to building a fine piece of solid wood furniture. But the real skill in furniture making lies in the ability to harness the exquisite beauty of matched patterns in wood only available by using veneer. Through the use of vacuum-bagging, we are able to produce everything from book-matched table tops and doors, to complicated diamond matches and inlay on three dimensional curves and conical shapes. 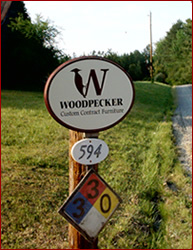 Vacuum-bagging or pressing uses atmospheric pressure to glue a veneer to a stable substrate in a urethane plastic bag from which the air has been evacuated. We maintain an extensive inventory of premium veneer flitches, which have been specially selected from the thousands available to us through the local High Point furniture suppliers market. Great care and extra time are always taken in considering the optimal veneer figure and pattern for each design. Samples in the actual veneer and finish are produced for approval. 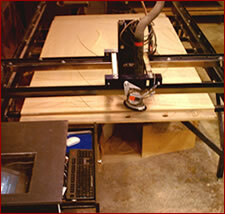 Today, our woodworking capabilities are enhanced by our CNC router. This machine takes our computer-drawn parts and develops perfectly matching tool paths for a router to cut accurate templates and furniture parts. In building a cherry library with an eliptical plan, we used our CNC router to produce over 75 forms that were, in turn, used to make curved moldings, doors, and panels. As CNC machining and advanced veneering techniques have revolutionized our furniture-making capabilities, so has our training in vigilance for attention to detail. We are constantly researching new hardware and new materials. Remote controlled electro-mechanical devices that open doors on media walls, adjust the height of lecterns or expose power and communications outlets in table tops are just a few of the many systems we have engineered into our corporate furniture. As computers and communications and projection applications have evolved, we have developed better, more cost-effective ways to integrate these technologies into the boardroom. As a custom shop, we are proficient in a wide variety of finishing techniques. This includes simple oiled finishes, oil and NGR stains, pigmented lacquers, clear catalyzed lacquers, catalyzed polyurethanes, conversion varnishes, and marine paints and varnishes. Many of our conference tables receive a beautiful rubbed finish of highly durable European catalyzed polyurethane. A full-time specialist finishes all of our pieces according to the requirements developed for each job. We keep detailed records of finishing processes for every piece and have an extensive selection of standard stain colors and integrated finishing systems.